Three homes, two barns and as many as six vehicles caught fire after the blast, he said. Two of the three homes were completely destroyed. The 30-inch natural gas line was about 100 feet from Highway 76 buried 30 feet down in the side of the hill. When it blew, the result was catastrophic, Thomas said. “There is now a crater 60 feet deep and it blew rocks out, and I don’t mean pebbles … big rocks,” he said, adding a 20- to 30-foot section of pipe was thrown more than 300 feet. After the explosion 20 homes in the area were evacuated and residents will not be able to return home until the state fire marshal says it is safe to do so, Thomas said. The gas line is used to transport natural gas from the Gulf of Mexico to New York and was not servicing homes in the area, he said. Like the pipeline Spectra wants to gouge through here. The Courier-Journal story says Columbia Gulf Transmission was in charge of that pipeline in Adair County, KY, but that’s not the whole story. 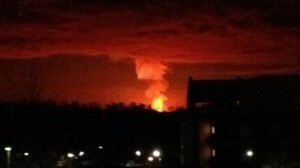 LCI Energy Insight, a gas analysis firm, said its database indicates the explosion likely occurred near where Columbia Gulf delivers into Texas Eastern at a rarely used or winter only service interconnect in Adair County. Texas Eastern is owned by a unit of Spectra Energy. 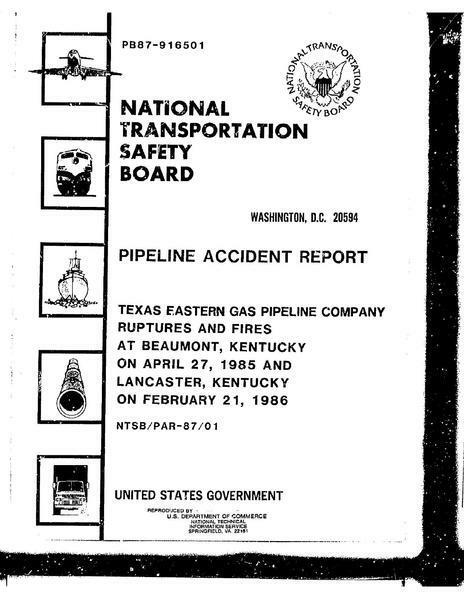 The probable cause of hte pipeline accident near Lancaster, Kentucky, was the failure of the Texas Eastern Gas Pipeline Company to fully investigate the extent and severity of previously detected and inspected corrosion-caused damage and to replace the damaged segment of pipeline before its failure. Contributing to the accident was the lack of gas company guidelines for its personnel for further inspection and the shut down or reduction in line pressure upon detecting corrosion damage on its pipeline. NTSB also investigated a very similar explosion about ten years later, Spectra’s Durham Woods apartment fire, Edison, NJ, 1994, and NTSB found a very similar cause. In December 2012 PHMSA fined Spectra on five counts of not following federal regulations or Spectra’s own company procedures for maintenaince, instead permitting corrosion and leaks. And now this in February 2014. Maybe this one was not quite Texas Eastern; just its connected neighbor Columbia Gulf Transmission. But the pattern is the same: damage by the pipeline company itself, lack of inspection, corrosion, leak, explosion. And the gas pipeline companies cry foul at more regulations, inspections or laws monitoring their operations. They want to build more pipelines, faster to export the natural gas from the Marcellus Shale or the oil from the Bakken Shale or the tar sands with the KeystoneXL pipeline. There is no consistent or comprehensive regulation or oversight for inspection and monitoring of gas or oil pipelines in the US by Federal or State regulatory agencies. And after all of these accidents these very same companies don’t want anymore regulations and inspections. Enough! We need to demand that there be tighter regulations, more inspections and monitoring by some agency not beholden to the gas and oil industry. The “unregulated, invisible hand of the free market” has and will never protect us from these greedy, short sighted pipeline companies who are only concerned about the maximizing of profit. How much profit really is enough?